Here's a very easy Valentine's card for you today. I didn't have a lot of time to stamp, so it HAD to be easy! This was inspired by a hand towel I saw somewhere. The swirl is stamped with burgundy ink on red paper, and then I went over it with my Sakura clear glaze gel pen. 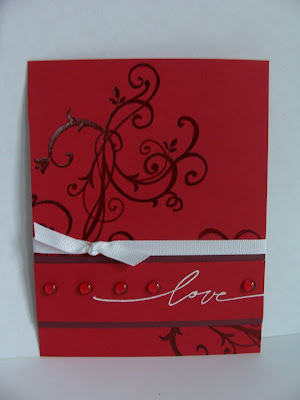 I stamped "love" in versamark on red paper and embossed in white. I layered it on a strip of burgundy and adhered it to the base. I tied a white knot around the whole card, and added dew drops last. I think darker dew drops and white taffeta would be better, but hey, you gotta work with what you have! Wow! Its stunning! very elegant! Oooh.....pretty! Very romantic and those dew drops are so cute! never in a million years would i have paired the red/burgundy- but you made it work! Beautiful- the white just pops! I love this~ the dew drops are *so* fun!! I *so* miss my SU! stuff at the moment!!! Great card!!! This is a gorgeous V Day card! This color combination is so stunning. The white just pops. TFS!